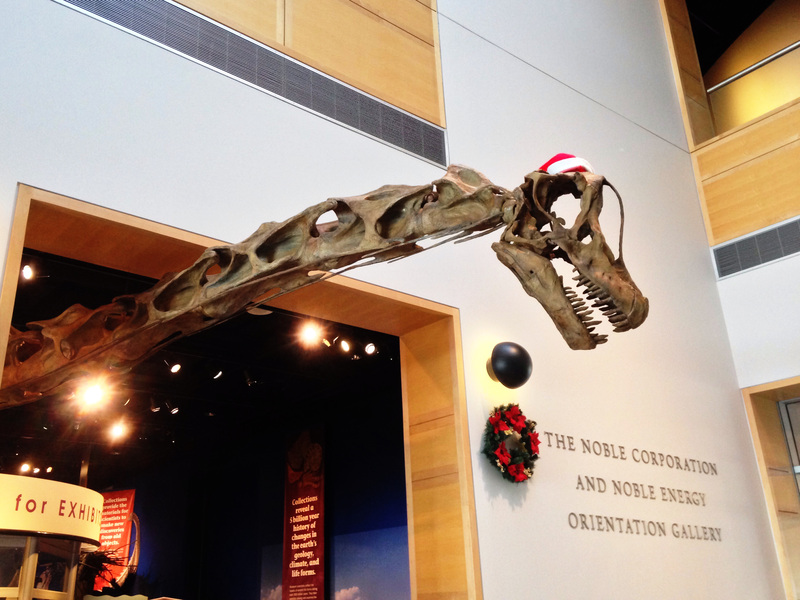 I’m back in Oklahoma for the holidays, and anytime I’m near Norman I pop in to the OMNH to see old friends, both living and fossil. 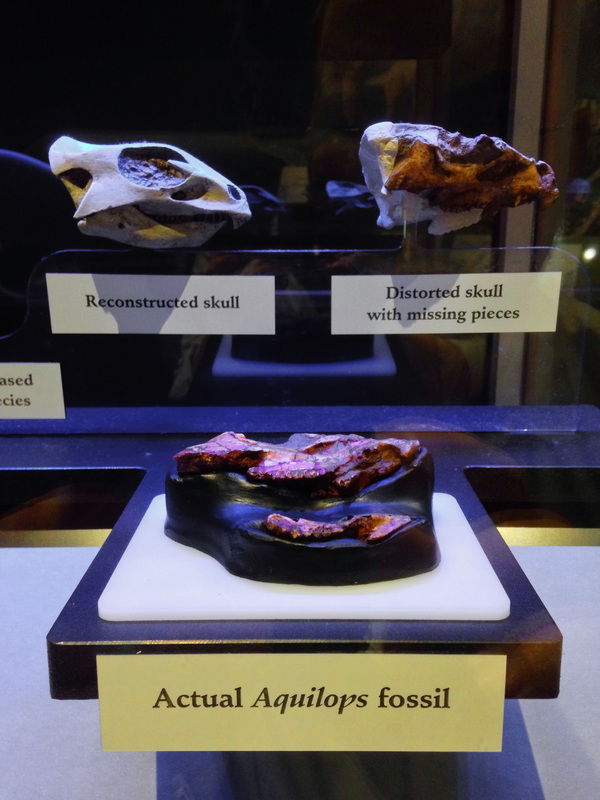 Here’s the Aquilops display in the hall of ancient life, which has been up for a while now. I got some pictures of it when I was here back in March, just never got around to posting them. Aquilops close up. You can’t see it well in this pic, but on the upper right is a cast of the Aquilops cranium with a prosthesis that shows what the missing bits would have looked like. That prosthesis was sculpted by – who else? – Kyle Davies, the OMNH head preparator and general sculpting/molding/casting sorceror. You’ve seen his work on the baby apatosaur in this post. I have casts of everything shown here – original fossil, fossil-plus-prosthesis, and reconstructed 3D skull – and I should post on them. Something to do in the new year. 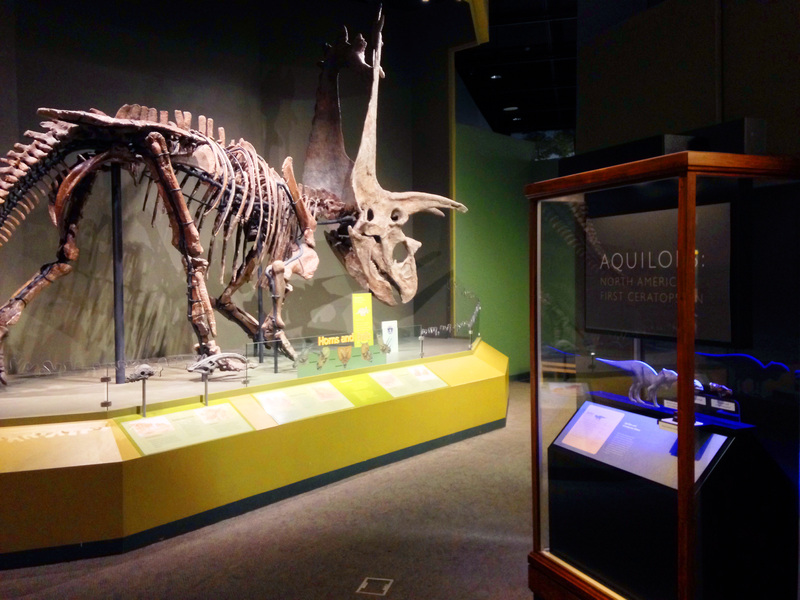 The Aquilops display is set just opposite the Antlers Formation exhibit, which has a family of Tenontosaurus being menaced by two Deinonychus, and at the transition between Early and Late Cretaceous. 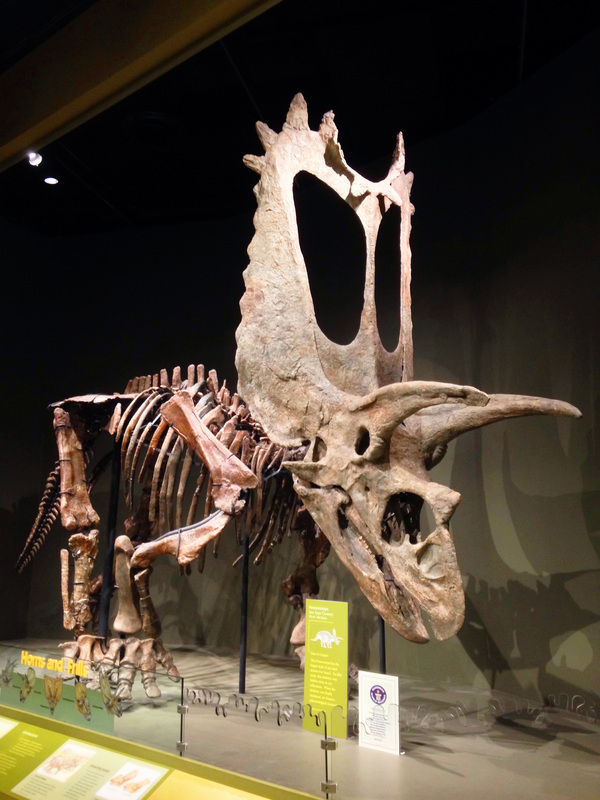 The one mount in the Late Cretaceous area is the big Pentaceratops, which is one of the best things in this or any museum. Evidence in support of that assertion. Standing directly in front of this monster is a breathtaking experience, which I highly recommend to everyone. 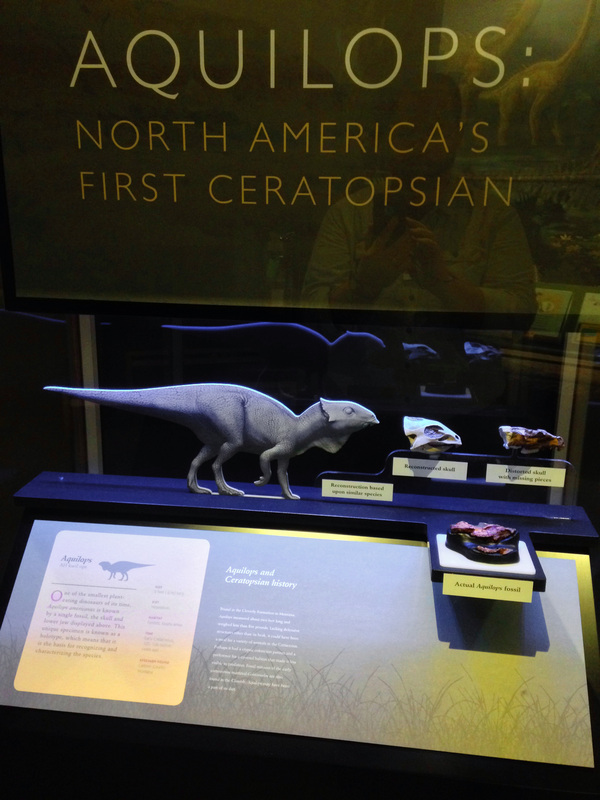 It’s just perfect that you can see the smallest and earliest (at least for now) North American ceratopsian adjacent to one of the largest and latest. Evolution, baby! 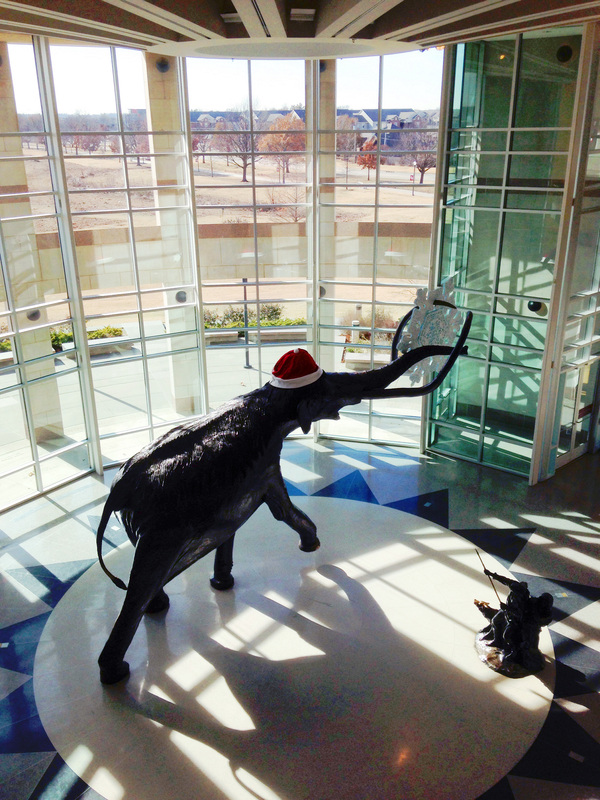 I didn’t only look at dinosaurs – the life-size bronze mammoth in the south rotunda is always worth a visit, especially in holiday regalia. No holiday post about the OMNH would be complete without a shot of “Santaposeidon” (previously seen here). I will never get tired of this! The chances that I’ll get anything else posted in 2016 hover near zero, so I hope you all have a safe and happy holiday season and a wonderful New Year. Aquilops!!! Argh, I really need to get over there now! It’s just close enough to me to be feasible, but just far enough away to be a little daunting, at least with a toddler in tow. I realize I’ve come to really look forward to SVPOW posts like this – every time, as an educated person but lay to this field, I learn something fascinating about dinosaurs that only expert pictures with museum or research text can convey, like the footprints of your post that started my own holiday break last week, downloaded it to read as the plane took off. There are photos of excellent things, but they are not excellent photos. Perhaps your 2016 resolution could be to always have your actual camera with you when you visit museums, not just your phone? Andrew – it is a _very_ worthwhile visit, but I know how daunting long drives with toddlers can be. Maybe an overnighter? There are lots of other things to do and see in Norman and in the OKC metro area. Not least of which is the Museum of Osteology in south OKC, which I’ve blogged about a few times here. Brad – many thanks for the kind words. I would be happy to sign and send you a book. Please check back with me sometime after January 2 and we’ll get it set up. Mike – it’s a fair cop. On one hand, kind of pathetic that I went to the museum armed with nothing more than a handheld iPhone. Then again, better this than nothing. I second Mike’s comments and add to them that you need to figure out how to get WU to just pay for me to travel with you & a shiny camera as official SV-POW visual supplementator so you can just point at a thing and say “Brian, generate lots of high res, properly exposed imagery of that” and a sprawling archive of HD photos and videos will come out the other end of the pipe. I would be in favour of that. Matt – I think it’s after Jan 2, unless you meant next year! So happy new year, and if you can see my email address as blog moderator, we can take a boom discussion off-blog. Fwiw, the Perot museum in Dallas has some really neat displays, too – maybe the first time I’ve seen, live, a sauropod skeleton mounted correctly by today’s standards – which may reflect more on how little I go to such museums these days. But my iPhone pics aren’t great – a lack of time to wait for lighting and finding perspective changes, I was with kids and grandparents who probably couldn’t care less. Their mosasaur exhibit is, as you migh expect, fairly good – plenty good enough to see that the early Dallasaurus already had the 3rd jaw on top, though there wasn’t much in the way of explaining that nor its hideous use. They also had a good ceratopsian display: having seen the ball joint at the base of the triceratops skull at other museums (didn’t look closely this time), occurred to me: present theories call the frill lightweight and therefore of dubious structural function, but wouldn’t a heavy frill (even if meaty instead of bony) simply counterbalance the massive chewing and horn-bearing apparati, allowing less muscle energy spent simply holding the nose up? I realize that would only push a worse problem back to the shoulders, of holding the whole neck up, but that’s already been done with many dinosaurs and their long necks and tails, by ossification iirc, or at least extra ligamentation. I guess it would be neat to see these creatures live even for a few seconds, get some posture & behavioral clues.